Thomas is teaching at the Musikhochschule in Detmold since 2004. 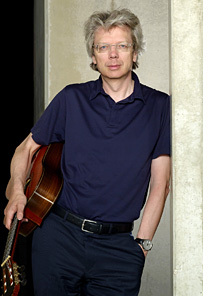 After having established one of the biggest and most prestigious guitar festivals in the world (www.guitarsymposium.com/) in Iserlohn/Germany, Thomas Kirchhoff organised the Acadia Classical Guitar Festival in Wolfville, NS, Canada. German born guitarist Thomas-Friedrich Kirchhoff studied at the Musikhochschule in Dortmund and then privately in London with British virtuoso David Russell from 1986 to 1987. Since 1986 he has given more than 800 concerts in over 30 countries (besides in the Amadeus Guitar Duo he played between 1989-1993 in the Ensemble Duo "Ars Vivendi" with German flautist Doris Dietz). He has produced eleven highly acclaimed CD's. Interviews with Thomas Kirchhoff and Dale Kavanagh appeared in Classical Guitar (2001), Gitarre & Laute (1996), Gitar och Luta (1999), Musikblatt (1994), Klassik Heute (2000), Akustik Gitarre (1998), Scala (1999) and Fono-Forum (2001). Prominent composers have dedicated Thomas Kirchhoff their works. Among them are concertos for two guitars and orchestra by Harald Genzmer of Munich and Gerald Garcia of Oxford. Works for guitar and flute and works for the Amadeus Guitar Duo have been written by a wide range of composers including Stephen Dodgson, Carlo Domeniconi, Roland Dyens, Jaime Zenamon, Martin Herchenröder, Toby Twining, Harald Genzmer, Peter Michael Hamel, and Christian Jost. In 1992 he founded the International Guitar-Symposion Iserlohn, Germany that is with more 220 students from 50 countries now one of the largest and most prominent international guitar festivals worldwide.